Based on the amazing AS5134^ (76,875 RPM) or AS5047P^ (4000 CPR), this encoder produces standard quadrature Index, A and B phase signals just like any standard encoder. It also stores the current position internally and that can be read out via a special digital interface. 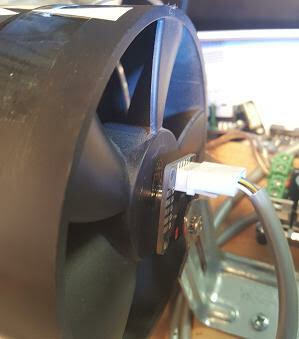 The difference is, it uses a magnet you epoxy to the end of the motor shaft, and it doesn't have to touch that to work. See: How it works. No need to mechanically attach to a shaft, just epoxy a small magnet in place. Great for motors with one shaft. The onboard LED indicates that the board is powered, and provides easy testing the alignment of the IC with respect to the magnet. Multiple connection / cable options are supported. Standard Quadrature A and B phase outputs, as well as several digital modes. 1 5V Positive supply input for the board. 2 B Incremental encoder quadrature output. 3 GND Ground pin for the board. 4 A Incremental encoder quadrature output. Channel A leads channel B by 90 degrees in clockwise rotation (top view). 6 Index Incremental encoder index output. JP4 1x6 header 1 GND Ground pin for the board. 2 5V Positive supply input for the board. are ground) 1 Index Incremental encoder index output. 3 A Incremental encoder quadrature output. Channel A leads channel B by 90 degrees in clockwise rotation (top view). 5 B Incremental encoder index output. 7 GND Ground pin for the board. 5 Index Incremental encoder index output. Single Row: If you are building this to work with the BOB PID, this is probably the best option. 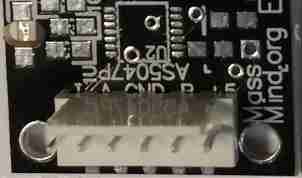 A Molex KK or 1x5 or 1x6 header soldered through hole can also be used. In this case, it is good to use a polarized header so that it can not be plugged in backwards and a shielded cable for long runs. PMinMO: A 2x5 header soldered on the edge with the PCB inserted between the pins which are soldered along the face of the pads. Used with a 10 conductor ribbon cable and IDC female 2x5 connector, this option has the advantage of a ground line between each signal for very low noise and long runs. To install a PMinMO shrouded header, slightly bend the pins in to match the PCB thickness, then align pin one (marked with the triangle on the shroud) with the pin marked "Idx" on the edge of the PCB, The notch in the shroud should be on the top side of the PCB, where the chip is mounted. Solder a single pin, then check alignment and solder on the rest. 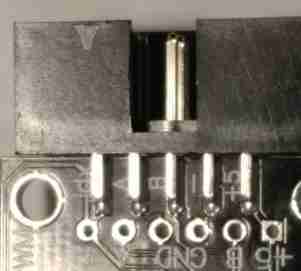 To avoid overheating the plastic and warping the pin positions, solder one pin on the top, then the opposite pin on the bottom, alternating back and forth. It also helps to have a female IDC connector cable plugged into the header while soldering. Small Terminal Blocks. (Not included) Certain holes in the 1x6 headers have been drilled a tiny bit larger. Those, and the two holes at the bottom of the board, will just accomodate 2 pin 0.2" spacing terminal blocks. A slight twisting of the blocks may be needed if they are two deep. The resulting connections will be GND and A (bottom), GND and B (side), and +5 and SI (SI can be ignored). The ground wires should be twised around the A / B signals to provide maximum noise immunity. Bare Wires: Or you can just solder the wires directly into the holes. Some strain relief, such as threading the wires through an unused mounting hole, would be wise. Magnet: Attach the magnet disk to the part where you need to sense angular position, e. g. front or back of the motor shaft, lead screw, ball screw, etc. The magnet should be mounted to the end of the shaft, flat against that end; a flat side of the magnet against the flat end of the shaft. For testing and alignment, the magnet will stick to any steel shaft, but vibration and shock will dislodge it. A two part epoxy is recommended for a permanent mounting. After placing the magnet, slowly turn the shaft to ensure it is centered and will not vibrate loose at higher speeds. The magnet is 0.100" thick and 0.235" diameter. Mounting: The board must be mounted so that the chip is close (less than a half inch) to the magnet and centered over the magnets axis of rotation. The board supports M3 or #4 screws. At least two screws (diagonally) should be used to hold it in position. Three screws are best. Click the picture for a detailed mounting diagram. Turn the shaft where the magnet is attached. 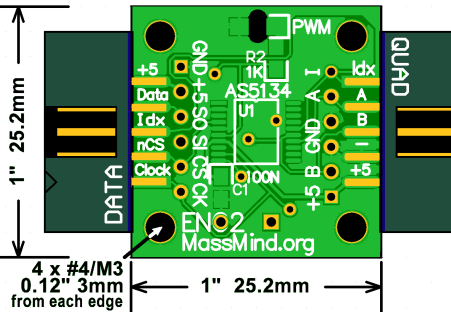 If the board is centered and in range of the magnet, the onboard LED will blink. Note: If the magnet is too far away, the encoder will send invalid A and B phase signals to let the controller know. 1. 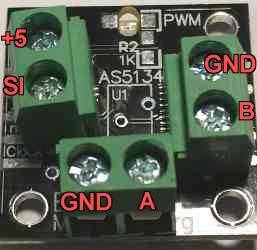 Add a pull down resistor of e.g. 10K ohms to Data until you can safely drive it low. 3. To start, with nCS low, bring CLK high, wait a uS, then bring CS high. 4. For each of 21 bits, wait a uS, CLK low, wait a uS, CLK high, read the DIO pin and shift it into a long. 5. To stop, CLK low, nCS low. The chip will see command 0 on DIO for the first 5 bits and will respond with the angle register in the bottom 9 bits. There is some other stuff in the middle which you can ignore. Once that is working, you can add code to drive DIO for the first 5 bits and then listen for the next 9 and read any register. e.g. command 4 reads the multi-turn register which has a 9 bit count of rotations in bits 7-15. This is really nice very high speed operation. 1. Initialize nCS as an output set high and CLK as output set low, Data as input. 2. 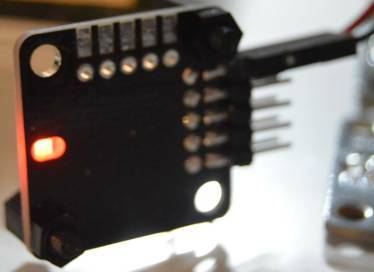 For each of 16 bits, wait a uS, CLK high, wait a uS, CLK low, read the DIO pin and shift it into a u_int16. 3. To stop, CLK low, nCS high. The chip will see the command "Read Address 0x3FFF" (the ANGLECOM register) on Data (MISO) for the first 16 bits and will respond with the angle register in the second 16 bits; the first reading will be invalid. Once this cycle has been completed the first time, each cycle after will continue to read back angle data. To read or write any register, just drive MOSI. This is less useful on the AS5047P as there is no turn register, but you can set it for 4096 CPR. 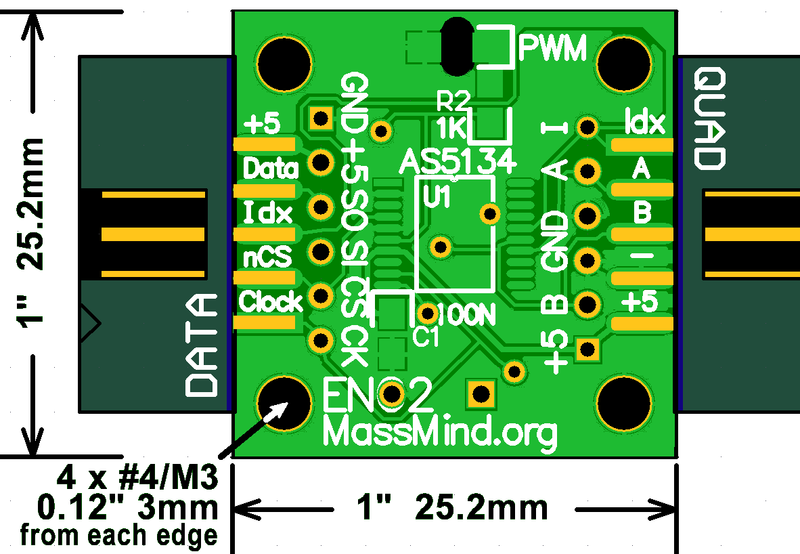 Most often, the ENC2 will be used as input to a PID controller, such as the MassMind BOB PID. https://www.youtube.com/watch?v=6iYVkAmXD4w Jim Fong's test run. Motor speed is limited by the voltage and physical ability of the motor. https://gist.github.com/JamesNewton/0ef27804defa2ee33246a77f3280b7f6 Arduino code to read angle register.